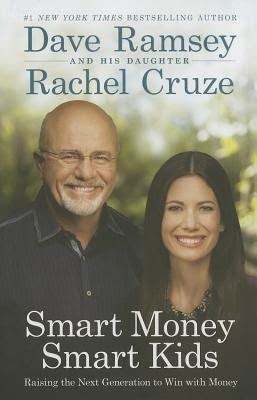 In "Smart Money Smart Kids," financial expert and best-selling author Dave Ramsey and his daughter Rachel Cruze equip parents to teach their children how to win with money. Starting with the basics like working, spending, saving, and giving, and moving into more challenging issues like avoiding debt for life, paying cash for college, and battling discontentment, Dave and Rachel present a no-nonsense, common-sense approach for changing your family tree. My thoughts: First, I just have to say that I love my job. Getting books for free to review is just about the coolest thing ever, especially when it's a book I want to own and now do not have to purchase. With that said, I'm not sure any money parenting book will ever top the Money Smart Family, which I reviewed here. That is such a top-notch book, and while I learned new things from Smart Money Smart Kids, it's not as thorough or as in line with my own beliefs about money and children as the Money Smart Family. I'm going to discuss some of the things Dave and Rachel did or suggest that I do not agree with and explain why. One is giving your child all of the money you normally would pay for their expenses per month and put it in a checking account for them to manage each month when they're a certain age. Certainly, it's not necessarily a bad idea. If you're a traditional family, this could work for you. We're anything but traditional. I not spend money on Bug each month with the purpose of spending money. I buy her only what she needs and this is frighteningly minimal. If Bug's wants change, that's up to her to fund. I will provide her with basic clothing, food and a roof. Honestly, the rest is up to her. If she wants to go to the movies, that's on her. If she wants to go for ice cream on a non-family outing, that's on her. If she wants to buy a birthday present for a friend, that's on her. Dave matched each of his children's savings for a car. That's great, and I'm sure they were all blessed by that. I feel like I don't have a lot of weight here since my parents did buy me a car, but we do not plan to buy Bug a car or match her savings or anything of that nature. If she wants a car, that's on her. I would be much more likely to match savings for a quality bicycle. It's not a money thing. It's probably just a me thing, but I would love it for her finances and lifestyle for her to ride a bike everywhere she could instead of driving. That would be a decision I could more stand behind. I felt that Dave and Rachel, by the way they explained chores, were a little too lax in this area. Call it child abuse if you want (but I would call it child abuse NOT to), but children need chores. And they need to be responsible and accountable for those chores. Bug actually already has chores. She's responsible for handing me the silverware from the dishwasher for me to put away. She also helps with the laundry. And yes, she's 14 months old. She's also responsible for helping to pick up her toys. I have never once had to say anything to her because she hasn't done it (throwing fits for not getting our way... we're still working on that one). Certainly, this book is worth the read. Does everything they did fit with our lives and the way we're going to do things? No, but there are lots of good nuggets of information in the book. It's a book that I will keep forever and definitely read again in the future. Thanks to booksneeze.com for providing a copy of this book in exchange for my honest review.